Your Honda Civic’s radiator is one of the most important parts of the car, though most people wouldn’t include it alongside components like the engine and transmission system. A poorly functioning radiator can greatly reduce the performance of your Honda Civic, and it can sometimes even cause your car to fail completely. Here’s our quick guide to the importance of radiators and how to spot potential problems. Your Civic’s radiator does two main jobs. Firstly, it transfers heated coolant through a series of tubes. That coolant is responsible for transmitting the heat conducted by the fins of your radiator out into the air. Secondly, the radiator acts to stabilize the temperature of fluids in the turbulator, thereby optimizing the amount of extractable heat. Leaking: If you spot a leak from your radiator, make sure that the drain valve has been tightly closed. If the leak continues, the radiator is probably faulty. 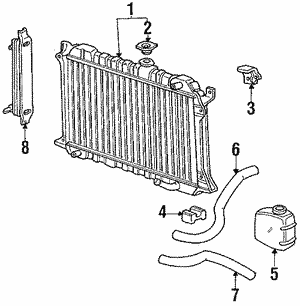 Rusting: If rusting is evident along the lower half of your radiator, it will not be operating optimally. Flush Problems: If you find that a buildup of either rust or minerals has restricted the proper flow during an oil change, your radiator probably needs replacing. A faulty or worn radiator can cause overheating, coolant loss, and prevent the internal temperature gauge from working correctly. If your Civic could use a new radiator, it’s vital that you use factory-made OEM parts from Honda instead of using an aftermarket manufacturer. OEM parts are engineered by the manufacturer, so they will fit your model perfectly and will be of the highest quality. They’ll even come with a warranty to ensure total peace of mind. A faulty radiator is one of those issues that you just cannot ignore. If you’ve noticed any indicators that your radiator might be in danger, don’t hesitate to contact one of the team at All Discount Parts for some advice. We stock original equipment parts for Honda models like the Civic, so we’re sure we can be of assistance.